The tour is designed to cover Priene, Miletus, and Didyma in a day either departing from Ephesus to visit it daily or on your way to Bodrum. Priene, a sacred city of wisdom with the Temple of Athena, a city of prosperity at a blessed location in the Meander Valley and a city of honor with its love of sovereignty who still carries her pride today in the beauty of her Hellenistic structures and age-old stories. Miletus; the city of Thales, Anaximander, Anaximenes, Leucippus and Hecataeus will take you to our intellectual past as far as 7th to 5th century BC when human perception started to shine with questions about the existence as a whole and sought mathematical, philosophical, astronomical and cosmological answers. The Temple of Apollo in Didyma, even incomplete after hundreds of years of construction, is still overpowering with its size and magnificence being the 3rd largest in the ancient world after Ephesus and Samos. Today's peaceful and somehow lonely sight of the ruins is in deep contrast with the old brilliant days of this ancient port town. Priene was a small but wealthy and constantly vibrant Ionian city with two harbors and the Temple of Athena that attracted large numbers of pilgrims. The dramatic terraced layout and the impressive view of the present plain- old Miletus Bay; and Mt. Mycale at its shoulder will give you exquisite chances of beautiful pictures and videos. Time took its toll and the harbor was silted by the Meander River, taking away the fame and wealth of Priene. After several relocations, most of the population left the city for Milet. The grid scheme of the city was a functional innovation of the time called the Hippodamus plan, a layout where 15 perpendicular streets crossed 6 main streets by leaving blocks in between for housing. The Temple of Athena Polias was the work of esteemed architect Pytheos who had also built Mausoleum of Halicarnassus. It is an outstanding example of a pure Ionic style temple whose 5 columns of the original 66 are still standing today. It was dedicated by Alexander the Great in 334 BC, who stayed here during his siege of Milet. You will be able to see the remains of the famous Alexander House along with some remains of other houses along the streets. The temple is close to the well-preserved Greco-Roman theater which is worth seeing with its 5 armchair seats in the cavea with lion-paw armrests, obviously reserved for the select high class. Another famous resident of Priene was the citizen philosopher Bias, one of the Seven Sages of Greece. “Do not praise an undeserving man because of his riches.” and “Most men are wicked.” are two well-known examples of his quotes. The intact Hellenistic city wall, the Upper Gymnasium, the Bouleuterion and the adjacent Prytaneion, remains of the Sacred Stoa and the so-called Fish Market are the interesting places to see on the upper terraces whereas the Lower Gymnasium and stadium were on the lower sections of the city. The city lived through Christianity and became the Seat of Bishop, the remains of the church can be seen near the theater on the way to the Temple of Athena. It was the major port city on the west coast of Asia Minor with its four harbors that made it the commercial center of the Mediterranean. It was noted as the most important of the 12 cities of Ionia, was also mentioned by Homer in The Iliad. However, couldn't escape its mortal fate when the harbor area began to be silted up by the Meander River and started to decline gradually after 3rd century. In 5th century BC, after the Persian destruction, the city was rebuilt in a newly invented arrangement called the Hippodamus grid, naming after the inventor. Also, famous citizens of ancient Miletus were Thales, Anaximander, and Anaximenes who put great effort into explaining physical reality without referring to a supernatural force; Leucippus is accepted as the developer of atomism and Hecataeus was the first to use the word "history." Isidorus must be credited too as he was one of the architects of the grand Hagia Sophia. It is also renowned with the two visits of St. Paul and mentioned in the Bible. The remains of the Greco-Roman theater welcome you on entering the site. It faced the Theater Harbor in its time and to the north of the hill behind the theater, was the Lion Harbour guarded by two marble lions one of which is still seen. An inscription in the theater says that Romans arbitrated a guarantee of freedom of religion to Jews in the city. The hill was used to construct a castle by using the material from the theater in the Byzantine age which provides a good vantage point to see the ruins of the site and taking wide angle pictures. The theater is one of the large theaters in Turkey and recognized easily with the four columns of the Emperor's Box in the front center of the cavea. It will be exciting for you to listen to the history of western Anatolia from your guide sitting on the very seats that Thales and Anaximander or a group of them philosophers had sat and planted the seeds of what we would later call chemistry, solar storm, cosmology, nanotechnology, and speed of light or quantum physics. Your guide will then lead you to the Baths of Faustina. Wife of Marcus Aurelius had this vast complex built to cherish the joy and the beauty that came with the kindness of waters. River God Maeander is one of the charming fountains inside. The bath was decorated with other statues; a lion, Apollo, Asclepius, the nine Muses in the Room of the Muses. At the entrance of the city from the Lion Harbor, was the Harbor Gateway, displaying a most impressive first sight for the newcomer when they disembarked the ship. The gate was the beginning of the Sacred Way and stood beside the Delphinion. The Delphinion, the temple of Apollo Delphinios, was a tribute to “Apollo of the Dolphins” meaning he was the protector of ships and harbors. Between the north and south agoras are the remains of a bunch of important buildings: the Byzantine Church of St. Michael from the 6th century AD, Bouleuterion, Prytaneion, Hellenistic Gymnasium and the Roman nymphaeum, all at the town center. In the 1st century BC, there was a massive Harbor Monument by the Lion Harbor which was richly decorated with reliefs of dolphins and Tritons. Next to the monument was a Roman synagogue of which not much seen today. The Hellenistic North Agora in the vicinity was the heart of the commercial activity. There was a Roman bath nearby where it's flooded in the rainy seasons in the present day. The Ionic colonnade from the mid-1st century marks the state center of the Roman Miletus both with its architectural form and the location on the Sacred Way. A restored portion will give you a better understanding of this once powerful city. The immense Market Gate that decorated the area can be seen in the Pergamon Museum in Berlin. The adjacent South Agora and the Hellenistic granary are badly damaged and not much seen today. Large cities of ancient times were where cultures and religions interacted and influenced each other just like today. Therefore it is not surprising to see a temple for an Egyptian god, Serapis Helios at a central location. The cult statue wore a beautiful crown of sun rays. The Roman Stadium is partially seen. It had monumental gates and three water clocks at each end. The city was connected to Didyma with a Sacred Way by Emperor Trajan in the 2nd century. Milletians would have an annual pilgrimage to Didyma Temple since the Hellenistic Age, a 20 km long walk by the Sacred Road. Didymaion, the Temple of Apollo and the oracle center is one of the most intriguing places in the world with its gigantic size and the history that might go beyond present human understanding. 122 enormous Ionic columns surrounded the temple in two rows and in the pronaos; today only three remain intact. They are 18 m. tall and have a diameter of 1.8 m at the base. Its history is also perplexing; the modern excavations didn't reveal anything older than 8th century BC but Pausanias of the 2nd century BC says the oracle center was constructed before the Ionian colonization in 10th century BC and what's more, many believe it dates from the 2nd millennium BC. 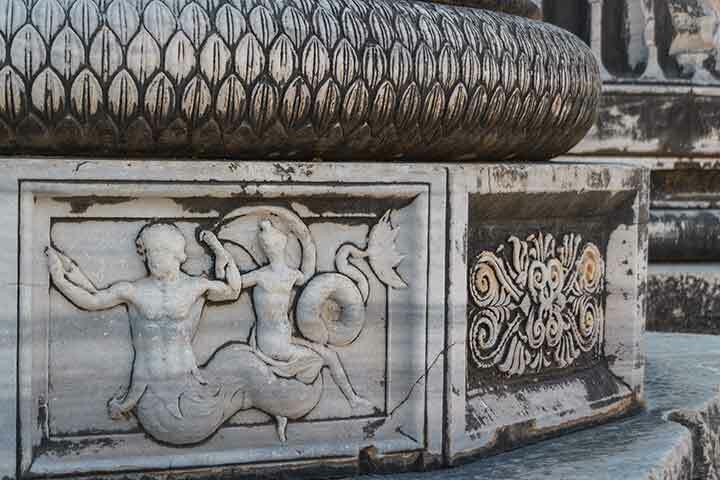 Didyma means "twin" and refers to the twins Apollo and Artemis, children of Zeus and Leto. Croesus, King of Lydia was especially fond of this temple and had dedicated plenty of gifts to the temple. The original structure was destroyed by Darius I of Persia in the 5th century BC and the treasures were looted. 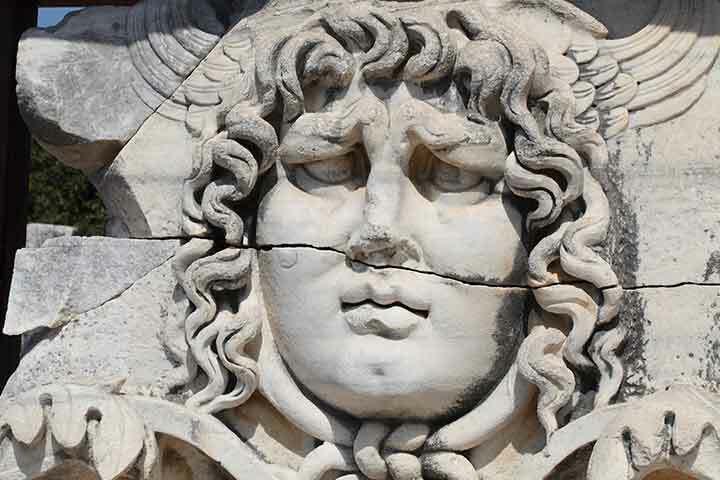 The Oracle of Apollo at Didyma was re-sanctified with Alexander the Great and was quickly back to its bright days. In 4th century BC, the Milesians started building a new temple which was intended to be the largest in the ancient world. Today we see the remains of that Hellenistic temple. The construction went on for many centuries and unfortunately was never completed. This was the exciting end of the Sacred Way from Miletus after having walked 20 km. to participate in the annual spring festivals. A strict and mysterious routine about the prophecies would both attract and intimidate people. The assembly would start by three days fasting of the priestess in the Adyton which was only for priests and oracles. On the day of the predictions, the priestess would take a ritual bath and enter the Naiskos. Meanwhile, people who were there to consult the oracle sacrificed and sang hymns outside. When it was time, the priestess was suspended over the sacred spring and would dip her robe or foot into the water before answering and giving complicated responses. Priests would then, translate them into poems. It came to an end when an oracle advised the oppression of the Christian church in 303 AD and consequently, the oracle center was closed by Constantine the Great. A Christian basilica was built in the Adyton in 5th century AD which stood intact until the 15th century together with the temple but an earthquake demolished the area beyond repair.